UTU Counselling 2018 is conducted online for admission to the first year of B.Tech (Full-time) courses in Government, Constituent and Private Technical Colleges in Uttarakhand. The admissions to the first year of B.Tech to these colleges is done on the basis of ranks secured by candidates in JEE Main 2018. 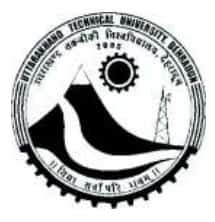 The UTU Counselling for the allotment of seats started from 7 June 2018 and will end on 21 July 2018 and was conducted by Uttarakhand Technical University (UTU). The candidates are called for counselling after the declaration of the result. This page gives complete information on the UTU Counselling which comprises the counselling schedule, counselling process etc. Allotment results are conveyed through SMS to all those candidates who had submitted their mobile numbers correctly at the time of registration. The candidates are allotted seats on the basis of choices submitted by them. The candidates have to take a printout of their provisional allotment letters. The selected candidate has to report at the Allotted Institutes/Colleges. To participate in the UTU counselling, the candidates first have to deposit the counselling fee till 16 June 2018 for the first round, 2 July 2018 for the second round and 21 July 2018 for the third round. To make the payment of the counselling fee, the candidates need to download the Bank-Challan & deposit the counselling fee. To do so, download the Bank Challan from UKSEE website by giving their JEE-Main Roll Number, mobile number and submit the fee any branch of SBI bank. At the time of depositing the fee in the bank, please ensure that the “Transaction-Id” has been properly filled-in by the cashier in the challan. After paying the counselling fee the candidate shall open the counselling website and have to follow the instructions given below. Given below are the instructions to register for UTU counselling. The candidate must keep a copy of his/her JEE-Main 2018 Admit Card and Bank Challan Copy along with them at the time of online registration. The candidate will have to select “Other-State” or “Uttarakhand Domicile” or “other state but 10+2 pass out from Uttarakhand” and have to mention the domicile state. Fill the registration form giving the other required details and submit. After successful registration, Candidates can take the Print-out of their Registration Details and keep it safe for future reference. Candidates may continue the choices filling work at this stage itself or may Logout/exit from the system and carry out Choices Filling work later by logging in again. The Candidates can fill their choices in order of their preferences of Institutes and Courses available. Candidates having Uttarakhand Domicile and opted for “Tuition Fee Waiver (TFW) Scheme” at the time of registration have to select the seats earmarked under TFW in addition to normal seats at the time of submission of their choices; otherwise, they won’t be allotted any seats under TFW quota. Candidates are advised to fill as many choices as they want, and it is in the interest of the candidates to fill maximum available choices so that they can get a seat of their choice in 1st round itself. Candidates are advised to keep on saving their filled choices at regular intervals so as to avoid the data loss and time due to the failure of internet connectivity or power-cut. The table below shows the seats reserved in each institute for the UTU B.Tech counselling. There are total 30 institutes given in the table below. The candidates are required to go through the table below as the seat allotment is given for the All India seats and the State seats. *TFW and Jk seats are in addition to the total number of seats. UTU Cut Off for the year 2018 will be released by the university soon. The candidates can go through the cutoff of the year 2015 to have an idea. Get the Institute and stream-wise cutoff list for all the B.Tech Programs. Total 703 lists of the institutes are given in the list which the candidates can find by following the link below. For any query related to UTU Counselling 2018, you can write to us in the comment section below.